The Middle: Is the ABC Series Cancelled or Renewed for Season Nine? After eight seasons, there’s just as much drama in the Heck household. Has the The Middle TV show been cancelled or renewed for a ninth season on ABC? The television vulture is watching for the latest cancellation and renewal news, so this page is a dedicated place to track the status of season nine of The Middle. You can bookmark this page or subscribe for the latest updates. Remember, the television vulture is watching your shows. Are you? Set in Orson, Indiana, The Middle TV show revolves around the five members of the middle-class Heck family. It’s headed by quarry manager Mike (Neil Flynn) and Frankie (Patricia Heaton), a dental assistant. They do their best to make ends meet and raise their three very different kids — lazy Axl (Charlie McDermott), awkward Sue (Eden Sher), and Brick (Atticus Shaffer), the intelligent yet odd youngest son. The program airs on the ABC television network. The eighth season of The Middle averaged a 1.48 rating in the 18-49 demographic with about 6.04 million viewers. Compared to season seven, that’s down by 22% in the demo and down by 18% in terms of total viewers. Compare The Middle’s performance against the other ABC TV shows. On January 25, 2017, The Middle was renewed for a ninth season. Season nine will debut on October 3, 2017 at 8:00pm. On August 2, 2017, it was confirmed The Middle will end with season nine. [wpdevart_countdown text_for_day=”Days” text_for_hour=”Hours” text_for_minut=”Minutes” text_for_second=”Seconds” countdown_end_type=”time” end_date=”26-07-2017 23:59″ start_time=”1501087355″ end_time=”69,7,17″ action_end_time=”hide” content_position=”center” top_ditance=”10″ bottom_distance=”10″ ][/wpdevart_countdown] Want to automatically receive updates about this TV show? The ratings have come down a little but The Middle continues to do well for ABC. This season, this sitcom helped the network cement their second night of comedy and that’s no easy feat. The network had previously said they were negotiating for a ninth season, and now ABC has renewed The Middle for season nine. The Heck family will be back in the 2017-18 television season. 8/2 update: There will be no season 10 of The Middle. The upcoming ninth season will be the final installment. Details here. TV show ratings are still important. Follow The Middle’s weekly ups and downs. Read other The Middle TV series news or other ABC TV show news. What do you think? Are you glad the The Middle TV show has been renewed for a ninth season? How would you feel if ABC had cancelled The Middle, instead? 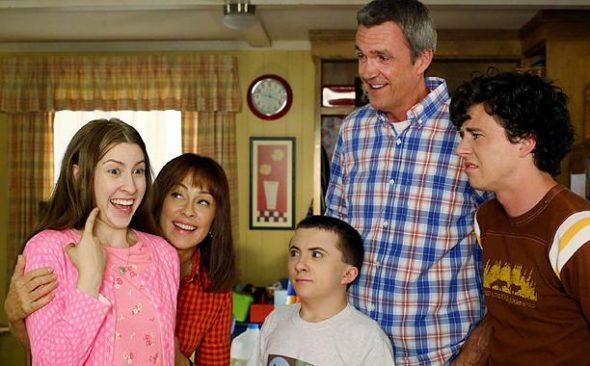 The Middle on ABC: Cancelled or Renewed for Season 10? Modern Family: Is the ABC TV Show Cancelled or Renewed for Season Nine? American Housewife: Cancelled or Renewed for Season Two on ABC? Shark Tank: Has the ABC TV Series Been Cancelled or Renewed for Season Nine? I really hate to see this show end. The Middle provides the most realistic programs compared to any other sitcoms. Let’s keep something positive going. .